Your home and style. Your story. Whether you’re looking for help designing your dream room or need help choosing one piece at a time, our expert designers are standing by to assist. We’re a five-generation family business who’s here to stay. We’re not satisfied until we bring you the newest product and designs and are always on the lookout to innovate. At Cabot House, the sky’s the limit. What problem can we solve? Help us get to know you by answering some quick questions. They’ll be passed on to a designer in your area. 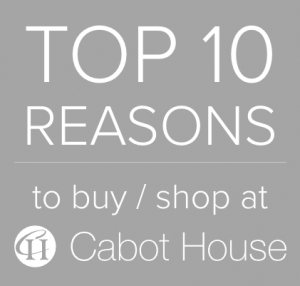 Your Cabot House designer will contact you and make an appointment for an in-home consultation followed by a custom presentation of furniture, fabrics, and finishes to fit your style. After your custom furniture order has been finalized and your items arrive, your designer will arrange for your hassle-free delivery. What room can we help you furnish? In terms of color, would you like this room to exude a sense of calm or energy? Good design solves problems. What isn’t working for you about your space? What budget are you aiming to stay within? Any other additional thoughts or comments? If you’d like, you can upload photos of the space you are looking for help with here. Please provide your phone number if you choose Phone or Text. Which store location is most convenient for you?